Now well over 40 years old (formed in 1971) to join write to Keith Andrews membership secretary, 2 Westgate, Fullshaw Park, Wilmslow, Cheshire SK9 1QQ or phone (01625) 525699. A New Jensen Sports Car to be known as the JENSEN S-V8 was first revealed at the Motor Show in October 1998 at the NEC in Birmingham. The Jensen Owners Club had been informed that some of the UK's most talented, respected engineers and designers had been involved in creating this exciting new car. We were also told that quite a good number of orders (about 300) had already been placed and that this car should be seen on the roads early in 1999. 17th October 2000 - The Jensen C-V8 coupe was shown at the Motor show, NEC Birmingham - styled and designed by 'Design Q' the same team that designed the S-V8. But it is sad to learn now that there is no future for the production of these newer cars - historically in the past Jensen had faced so many problems and now it has failed to survive again as a manufacturer. But the name lives proudly on in the Classic car scene. 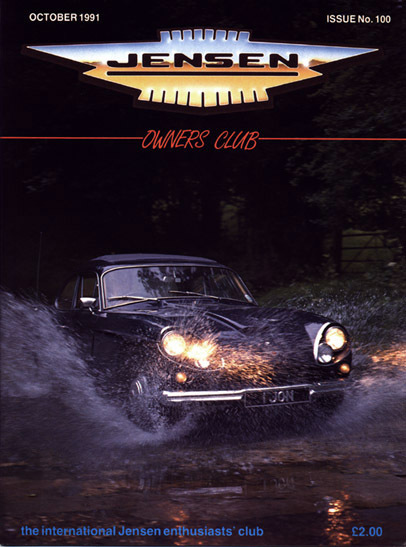 A private collection that once consisted of 5 manual drive 541S Jensen cars, 3 automatic, and a very special CV8, a one off Jensen, commissioned by Hardy Amies. 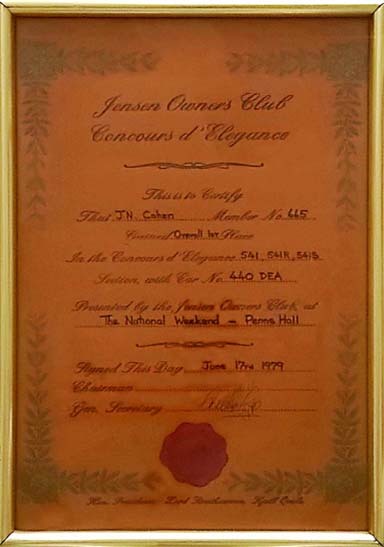 The quality of this collection is obvious for out of the nine cars, six have been Jensen Owner's Club Concourse winners. I JON at times First in Class 1978, Overall Best 541 Cup 1979, Master Class Trophy 1980. 102/1081 chassis 160 TPP First in Class 1975, 1976, 1977. 102/1123 chassis 541 FBF First in Class 1983. 100/1055 chassis 838 EEA First in Class 1981. 100/1062 chassis 36 DUC Second in Class 1982. I JON at times Second in Class 1981. This CV8 is an exclusive "one off" especially built by Jensen, for Hardy Amies Esq., and it was first registered in December 1964. Hardy Amies of Saville Row were engaged by Jensen to advise on the choice of materials, and colour combinations. The brief was to improve the looks of the CV8, for the mark III, that was soon to be released. The mark III has quite a lot of changed exterior features and a far more luxurious interior than the mark II. Hardy Amies decided to order one (possibly part of the deal) anyway the car he commissioned surprisingly was not the latest mark III. 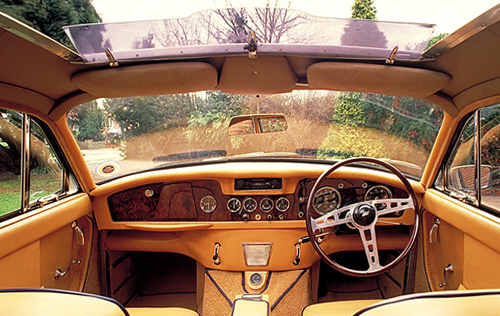 His car is a mixture - a mark II with the new mark III interior. I must say that I agree with his choice as I prefer the mark II shape myself. The result was this special car, indigo blue with a camel coloured pigskin, interior. It is also one of very few CV8 cars fitted with a large Webasco sunshine roof. This car also has the larger 6276cc Chrysler V8 engine. Hardy Amies must have enjoyed this car as he kept it for well over 5 years. We are the sixth owner and a few years ago I had the car completely rebuilt. It was resprayed the original colour and the interior replaced by camel leather, rather than pigskin, - not a kosher material for my use! But we had all the leather, and the matching carpets piped in dark blue leather to match the paintwork. One other improvement was the beautiful walnut dashboard to replace the original formica one. So I am guilty, this car is no longer in original condition, instead it became a Cohen original! Like the quality of these photographs? You can easily return just by clicking on your browser 'Back' button. Special photographic effects, without a darkroom or a computer! 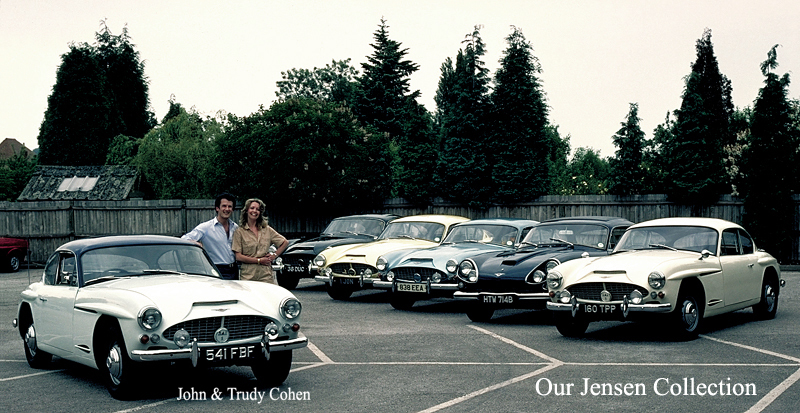 We have sold all our Jensen Cars, five of our 541S cars went to an enthusiast in Denmark. We gave our son Jason 541FBF (a 541S Manual drive). What do we drive now? "... maximum speed of 136 mph ... one of the fastest cars we have ever road tested and certainly the fastest full four seater." Comparing with Aston Martin DB5, Ford Galaxie, Ford Mustang V8, Gordon Keeble, the CV8 was the fastest car from 0 - 60 and the quickest to cover 1/4 mile from a standing start. 0 - 50 mph 5.0 secs. 0 - 60 mph 6.7 secs. 0 - 100 mph 17.6 secs. Standing 1/4 mile 14.6 secs. 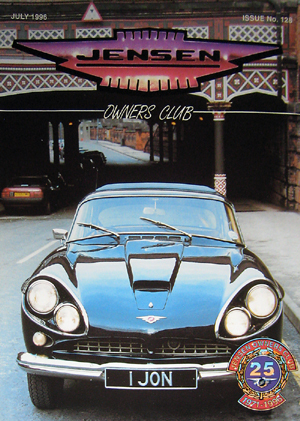 The Information Pages, Classic Jensen Cars, Jensen, Autos, Classic cars, CV8, 541S, Concours winners, Sports cars, high performance, Automobiles, fibreglass, V8, straight 6, John Neville Cohen.